Hollywood's Got A Bad Case Of Sequelitis This Year This year, Hollywood will release 28 movie sequels — more than any other year — and while all these Part 2s, 3s and 4s may be good for the industry's bottom line, it's making NPR movie critic Bob Mondello's job tricky. 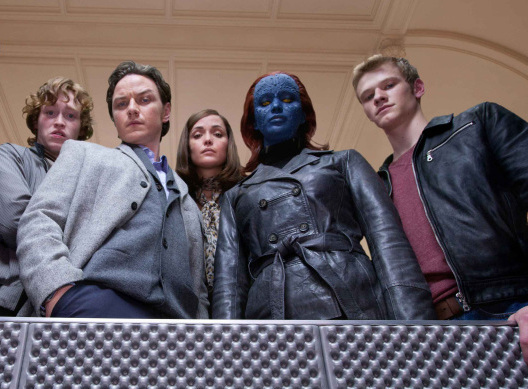 The X-Men franchise released its fifth film this year. 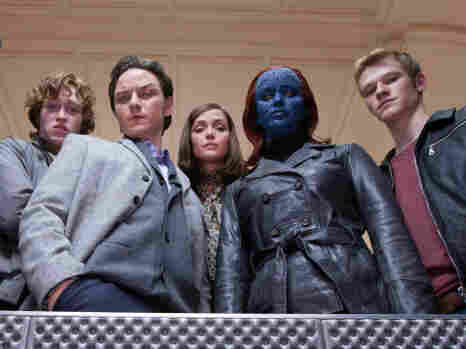 X-Men: First Class stars Caleb Landry Jones (from left), James McAvoy, Rose Byrne, Jennifer Lawrence and Lucas Till. This year, Hollywood will release more movie sequels than it has in any other year — 28 at last count — and while all these Part 2s, 3s and 4s may be good for the industry's bottom line, it's making my job tricky. Partly it's the math. X-Men: First Class is really X-Men Five, but it has "first" in the title to let you know it comes before the others; Rise Of The Planet Of The Apes is the seventh film in that series, but it's also a prequel so I've been thinking of it as Planet Of The Apes: Part Minus One; and the final Harry Potter flick is Part 8 in a seven-part series because — what the hey — they can. See, Warner Brothers split the last Harry Potter novel into a pair of films, so this second Deathly Hallows is Harry Potter: Part 7, Part 2. The Twilight series will be doing the same thing with its last book and I suppose I shouldn't complain — they could just as easily have made it a trilogy. No doubt that'll occur to someone soon enough, and we'll be able to look forward to Part 12 in a four-part series. Though it feels like we're already there sometimes. Thank heaven Super 8 and Apollo 18 aren't sequels. Stop me if you've heard this plotline before ... actually, don't bother. We've all heard it and will no doubt hear it again. Because in 2011, there will be nine Part 2s, five Part 3, six 4s, five 5, two 7s and an 8. If I'm doing the math right, that means the average sequel this year is Part 3.7. No wonder everything feels so familiar. All these installments remind me of when I was a kid and picked up a volume of The Complete Sherlock Holmes. I loved the first story I read, and the second. But after a while, I started figuring out the rhythms and the setups and before long I was muttering, "Elementary, my dear Watson," a page before Holmes did — at which point the stories weren't as much fun. We're obviously not there yet with the Robert Downey Jr. movies — he's also got a Part 2 coming up — but we sure are with Shrek, Pirates of the Caribbean and Alvin and the Chipmunks. Do we really need more of those? And, forgive me, but are we really up to film five in a series that's always called itself Final Destination? In the words of the death machine franchise's latest victim: "Are you saying we can't stop this?" Apparently not. At least not as long as studios can say they're bringing the characters back by popular demand. I'm not sure who was demanding Hoodwinked Too — whoever it was, please stop — but when films make a couple of hundred million dollars, it's perfectly understandable that producers say, "Ooh, let's do that again." It's just good business sense. Second films are easier to get financing for; they're already cast and they're pre-sold, so promoting them is simple. So much so that the second film in a series often outperforms the first at the box office. After that, the glow generally fades. But increasing interest overseas now ensures that even as a franchise ages, the numbers stay big enough to keep it profitable — and you can't really argue with the numbers. So far this year, the top three box office hits are all sequels — The Hangover Part II, Pirates Of The Caribbean: On Stranger Tides and Fast Five. In the past couple of months, those three pictures have collectively made more than $2 billion, and this is nothing new. For the past decade, there've been Roman numerals after the titles of about half of each year's top 10 hits, and in every year but one (2009, when Avatar opened) the No. 1 picture worldwide has been a sequel. What's more, the other half of each year's top 10 immediately turn into fodder for new franchises — hence Avatar 2 and Avatar 3, currently on the drawing boards. In short, Hollywood has figured out how to ensure not just that we get what we pay for, but that we pay for it again and again and again. * Numbers correspond to the number of films in each franchise.